Dashni Morad have had an intense year both working on her songs in London and working for her charity “Green Kids” helping children in refuge from Daesh in camps in Iraqi Kurdistan, where she provides classes, books and toys. 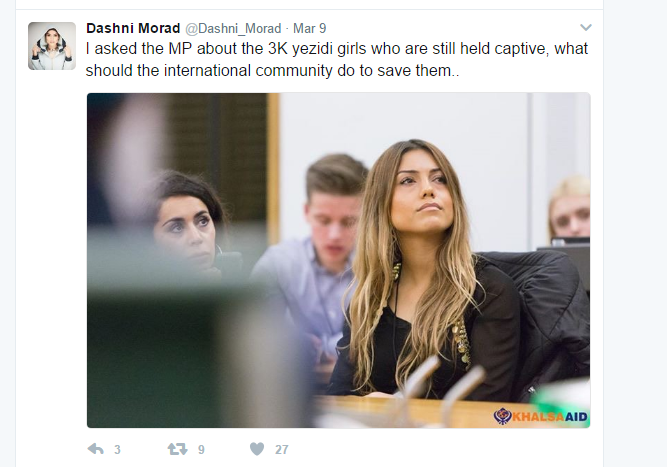 In addition to these projects, the Hawrami songwriter from Sulaymaniyah has also been very active defending Yazidi women taking part in several conferences and interviews, some of which took place in the House of Parliament. In her homeland, the thirty-one-year-old singer have had to face harassment and sexual exploitation in the music industry, but this has not stopped her from creating a unique style in her newest songs, which is very different from the style of many other Kurdish singers, it has an additional female power touch. Her new single, Love Wins, is dedicated; to the victory in Mosul against Daesh, the people living in refugee camps, to spread hope amongst children that one day soon they will go back home and feel safe. In addition, the song is dedicated to everyone in the world to love and be loved, regardless if they are straight or LGBT. The single and 7 additional songs from her new album was written and recorded in Los Angerles, here she was collaborating with a Norwegian team. The music video was shot in London. Posted in CRITICISM, FEATURE, Music and tagged #dashnimorad, #IraqiKurdistan, #kurdi, #kurdishsingers, #kurdishsongs, #Kurdistan, #Kurds, #london, #modernwomen, #newhits, #newsingle, #newsongs, #refugeecamps, #songs, #yazidiwomen, ART, Music, women'srights. Bookmark the permalink.